The first, the Fernandina and Jacksonville (F&J) Railroad was completed in 1881, connecting its riverfront wharves with Yulee to the north. After becoming a part of the Seaboard Airline Railroad system, the F&J’s wharves were converted into a coal terminal for the Logan Coal & Supply Company. Located at 662 East Bay Street, Logan specialized in shipping bunker coal, coal for local use and coal to customers in cities throughout Florida. In some years, coal was exported as far as Spain and France. During World War I, the company exported over two million tons of coal through its East Bay Street terminal, which included a long railroad trestle and pier into the river with a tower for loading vessels and steamers. In later years, the coal terminal property would become a part of the Jacksonville Shipyards site. However, much of what developed along the Northbank riverfront between Main and Marsh streets owed its existence to the Atlantic, Valdosta and Western Railway (A,V&W). Completed between Valdosta and Jacksonville in 1898, it was the last major railroad line built into town and it would transform the downtown riverfront in the aftermath of the Great Fire of 1901. That year, the A,V&W established the St. Johns Terminal Company (StJTCo) to build and operate industrial trackage between Grand Crossing and the downtown riverfront. Constructing a rail yard between Catherine Street and Hogans Creek, the StJTCo also installed industrial trackage along the riverfront south of Bay Street between Marsh and Main streets. 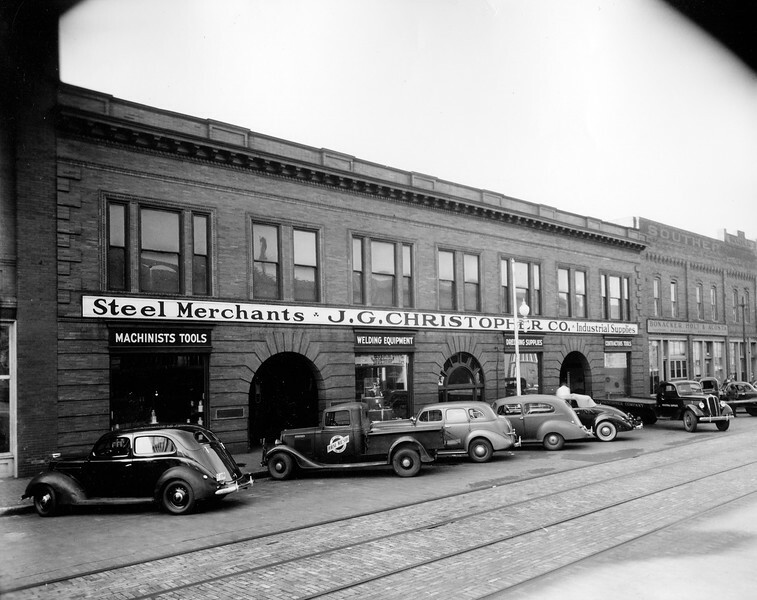 One of the city’s earliest ports served by rail, the StJTCo built and operated freight depots between Marsh and Washington streets while performing freight switching duties for other maritime related industries between Washington and Main streets. By 1910, large industries along East Bay Street included Logan Coal & Supply, T. Murphy Iron Works, New York Laundry, Kingan & Company Meats & Provisions, Cheek-Neal Coffee Company, Clyde Line Steamship Company, and Merill-Stevens Engineering Company. A major urban economic center for much of the early 20th century, the maritime district eventually decline due to changes in technology such as the creation of tractor-trailers and containerization in the shipping industry that rendered its compact centralized location obsolete. Further destruction came in the form of a June 8, 1941 fire that destroyed two of the Clyde-Mallory line’s three terminals between Market and Washington streets. The burned warehouse-piers contained expensive refrigerating equipment used in handling perishable shipments, resulting in $800,000 in damages for a company that was already struggling with the end of the steamship era. With maritime related uses shifting further downstream, East Bay soon found itself staring down the barrel of Mayor Haydon Burns’ Jacksonville Story urban renewal plan. By 1949, the Clyde-Mallory had closed altogether and by 1960, the site had been replaced with a new shiny county courthouse (currently being demolished). In addition, piers that once served passenger and freight vessels connecting Jacksonville with New York and Boston had been completely razed with a bridge deck (also being demolished currently), acting as a waterfront parking lot, taking it’s place. This collection of photographs were taken prior to the development of the Duval County Jail and the Jacksonville Sheriff’s Office headquarters. This is East Bay Street in 1968. A time when Maxwell House had neighbors with architectural character and of similar age. Imagine what a district with this collection of old brick buildings could resemble now if preservation were more of a local priority 40 years ago. 1. 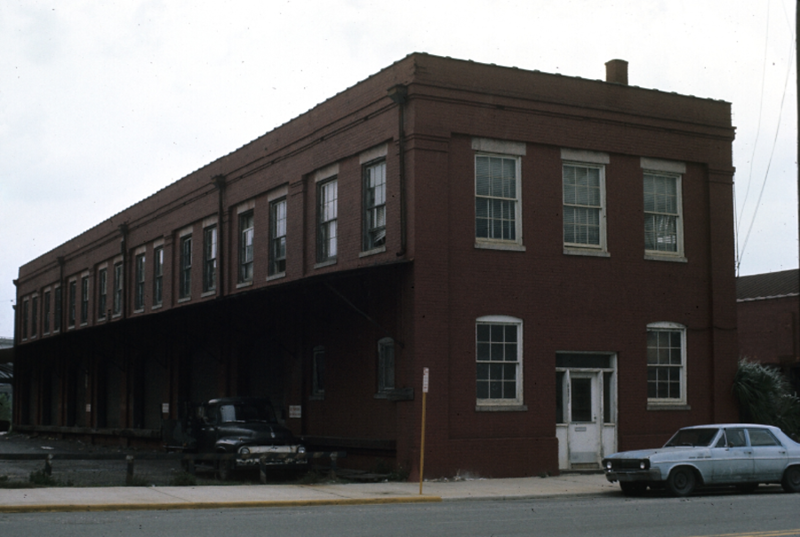 Located at the northwest corner of Bay and Marsh streets, this building originally served as a freight depot for the Georgia Southern & Florida Railway and Southern Railway. 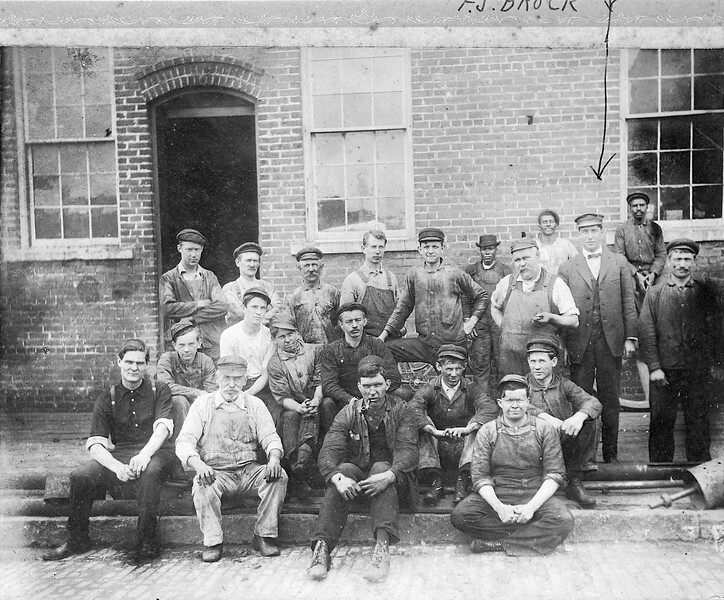 It was located across the street from the Jacksonville Shipyards and Logan Coal & Supply Company’s coal terminal. Maxwell House’s coffee roasting plant can be seen in the background. The site of the Georgia Southern & Florida Railway and Southern Railway’s freight depot today. 2. 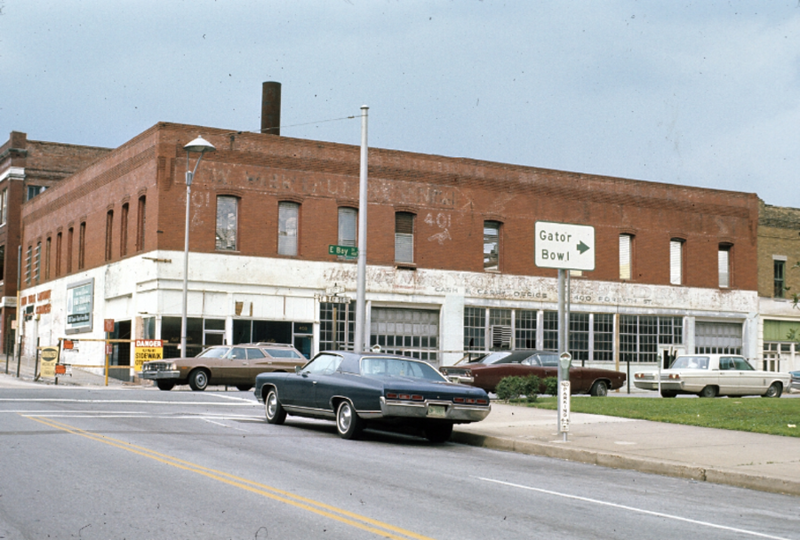 *Left: This building was originally occupied by the Hutchinson Shoe Company. In 1931, it was acquired by the Suddath Moving and Storage Company. Founded by Carl Suddath in 1919, the Suddath Company has grown to become the largest worldwide agent of United Van Lines and Mayflower Transit. Today, still headquartered in downtown, Suddath is a group of multifaceted companies with over 1,200 employees nationwide and over $200 million in annual revenues. Right: Built in 1902, the Catherine Street Fire Station (Station #3) was relocated in 1994 to its current home in Metropolitan Park. 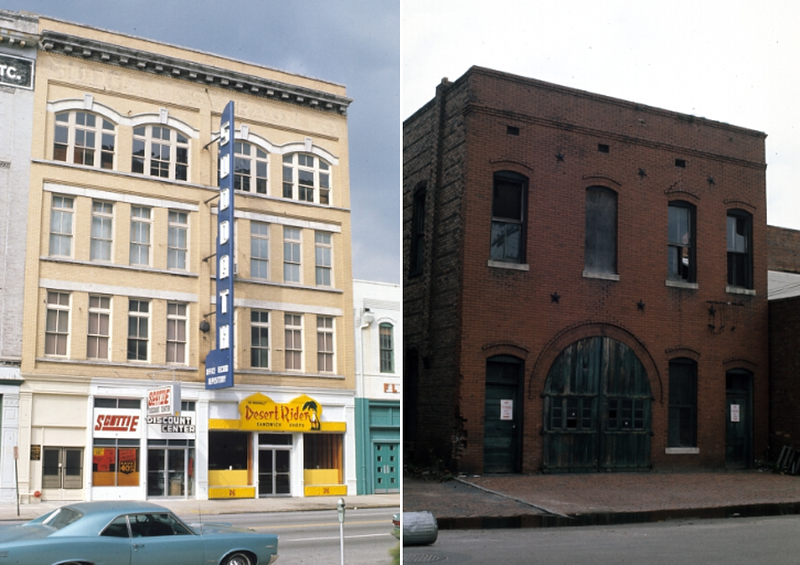 Listed on the National Register of Historic Places and designated as a City of Jacksonville historic landmark, the station was home to an African-American company of firefighters and is included as a part of Florida’s Black Heritage Trail. The Suddath building today. In 2003, Suddath restored the historic Hutchinson Shoe Company building into commercial lofts. 3. 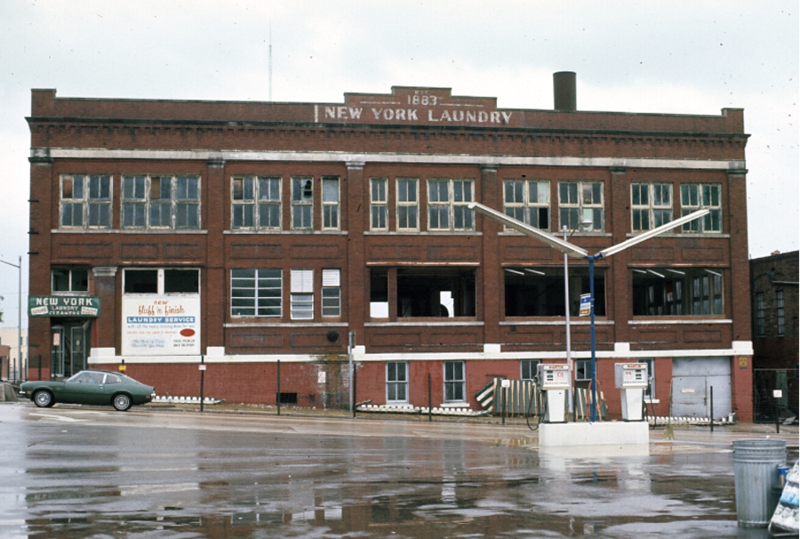 The former New York Laundry plant at the southeast corner of East Forsyth and Liberty streets. This building was razed for JSO’s headquarters. The New York Laundry building site today. 4. The intersection of East Bay and Liberty streets. 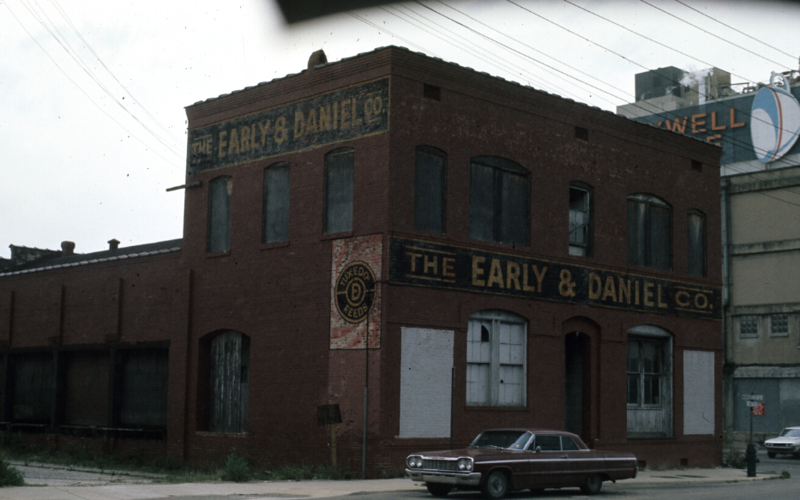 401-415 West Bay Street was originally built for McMurray & Baker Carriage Works. The intersection of East Bay and Liberty streets today. 5. Located on Bay between Catherine and Marsh streets, this building originally served as a freight depot and office for the St. Johns River Terminal Company. The railroad company handled the freight switching duties for the industries along the riverfront between Marsh and Main streets. The site of the St. Johns River Terminal Company freight depot today.